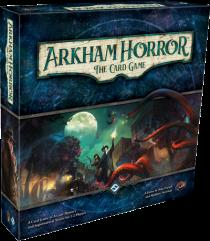 Arkham Horror: The Card Game is a cooperative Living Card Game set amid a backdrop of Lovecraftian horror. As the Ancient Ones seek entry to our world, one to two investigators (or up to four with two Core Sets) work to unravel arcane mysteries and conspiracies. Their efforts determine not only the course of your game, but carry forward throughout whole campaigns, challenging them to overcome their personal demons even as Arkham Horror: The Card Game blurs the distinction between the card game and roleplaying experiences.